Recently, I bought an EasiYo Yoghurt Maker. It is one of my new favourite things. In my various quests to make and grow as much of my own fresh and healthy food as possible (in my apartment), and to get my budget living, stay-at-home-mum skills on, I’m becoming cultured. Despite all these lovely, lofty ambitions, there are just some days when dinner is an afterthought. Eager to tuck in to my yummy, sugar free, fresh yoghurt, and find something quick and healthy to make for dinner, I made some Banana Parfait. I crushed up a few handfuls of my Activated Nuts, which was wonderful, as I really need to show my mortar and pestle some more love. I don’t have parfait glasses, but I *do* have martini glasses. And while I’m still breastfeeding, cocktails are quite rare round these parts, so I’m rather excited to have found a use for them and bring them back from sabbatical. Create your layers, as thick as you like, as many as you like. I made two for dinner, served with some of my home-made banana bread, plus an extra one for my lunch the next day. It was a surprisingly filling dinner actually, with the protein and good fats from the yoghurt and nuts proving quite satisfying, while the banana bread added something a bit more substantial to the meal. It only took a few minutes to throw together, and would be great to make for breakfast, or brunch for those of us Hashimoto’s sufferers who can’t have dairy in the morning! Next time I make these, I’ll slice the bananas thicker, and add some dessicated coconut and layer the yoghurt between banana and coconut, with the nuts away from the yoghurt to stop them from soaking up too much of the yoghurt. 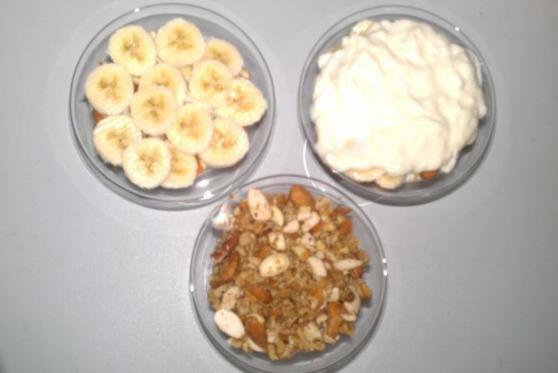 What sorts of ingredients to you put in your parfaits? Ooo, this is one of my ambitions that I wanted to become a habit, and it seems to have stuck. If you have never tried activated nuts and seeds, hang on to your hats people, they are so yummy, so good for you and so damn easy you wont even believe it. This little pot of goodness is more than enough for a delish snack, especially when those mid arvo cravings hit! But before I get into the hows, how about some whys? As many of you already know, nuts and seeds are an excellent source of fats, a little protein kick for between meals, as well as some great nutrients too. However, in order for our bodies to access all this awesomeness, a good deal of effort is required to overcome certain enzyme inhibitors which can cause digestive upset. 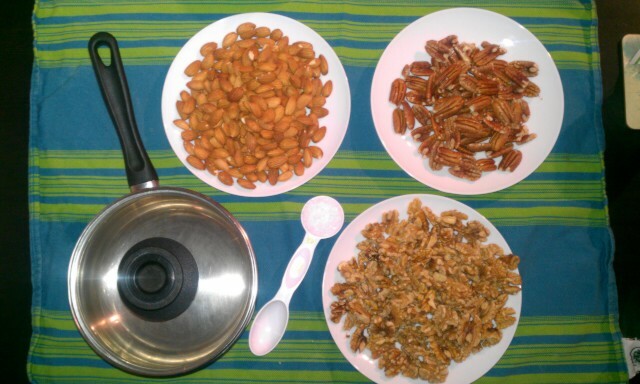 Activating them cuts out a lot of that effort; leaving your energy better spent elsewhere, chilling out some of the negative aspects of eating nuts raw, and making many more good vitamins and nutrients available for us to absorb. As far as Hashimoto’s goes, I find that nuts and seeds are fabulous. I try to pour a little ramikin for myself when I get up in the morning, so that as the day goes on and I need a little meal to kick along my energy and metabolism they are right in arms reach, derailing me from sugary foods. I try not to eat them every day tho. And they are awesome with yoghurt, and I LOVE the pepitas in salads – they add an awesome crunch and a teensy salty element, which is novel to me as I don’t use much salt anywhere in my cooking. Gather up some nuts and seeds – just make sure they’re not oily, so no peanuts, macadamia nuts, etc. 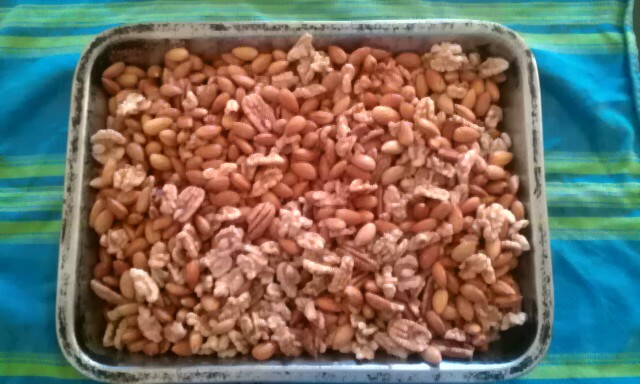 My favourites are walnuts, pecans and almonds. My favourite seeds are pepitas, or pumpkin seeds. Sunflower seeds lost a bit of their love for me and became a bit too thin, but have a go and see what you reckon. Soak your nuts and seeds overnight in a pot with a lid in enough water to cover and a little bit more, with one tablespoon of sea salt. I make a huge batch, so here they are soaking in my soup/jam pot. You might like to try just a bit on your first go, to see if you like them. You may be realising about now that my photography skillz are preeeettttyyy basic :s and yes, you guessed it, an ambition of mine to improve them! Drain off all the water. I don’t get too fancy, just hold the lid to the side of the pot and drain that way, and leave the colander alone. You will notice the water is a little brown, and the nuts a little lighter and possibly swollen. This is cool. Spread out in a big baking tray, without oil or baking paper, just au naturale. Cook for 12-24 hours in an oven set on the lowest possible setting. Just make sure its on, and doesn’t just have the fan switched on, like I did for an hour the first time I did this! Oopsy! About 70^C or so should be plenty. 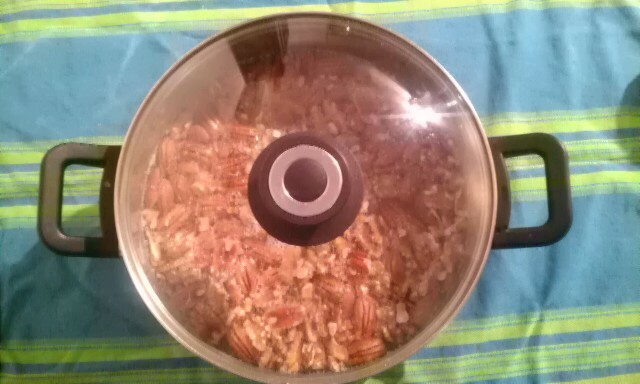 Every few hours, grab some tongs and move the nuts and seeds around, and try not to eat them all before they’re done! The longer you slow roast them, the better. I try to do this overnight when electricity demand and rates are lower, especially if its already warm. Freeze. Seriously, freeze these babies. They taste amazingly crisp coming out of the freezer, and keep longer. Double win! And enjoy. Sooo yummy. In fact, I’m going to grab some now. What do you think? Have you tried them? Do you have another way of making them? Let me know! Thank you to Sarah Wilson for the inspiration!